7th Regiment has an interest group for prospective members to connect with other corps members and staff. 2018 audition applications are now available for interested members of The Academy. With co-founder Dallin Hatch stepping down from his position as executive director, the Battalion has announced a new executive team that will lead the Salt Lake City corps through its 2018 season. Get a behind-the-scenes look at the 2017 Blue Devils by catching up on every “Inside BD360” episode from this past season. Blue Knights is reaching out to alumni while gearing up for the celebration of the corps' 60th anniversary in 2018. Blue Stars is seeking volunteers to help staff the corps' brat stand at the La Crosse, Wisconsin Oktoberfest event this fall. Bluecoats has partnered with the NBA's Cleveland Cavaliers to produce QStix, a drum line that will perform on trash cans and utility buckets at Cavs home games. The annual Crusader Classic Golf Tournament will be held on Friday, September 29 in North Attleborough, Massachusetts. Brass arranger Drew Shanefield gave an extensive and informative interview to Woodwind Brasswind about his work with the 10-time World Champion Cadets in addition to his job as an elementary music school teacher. Carolina Crown posted a recap video of the corps' service work this summer in Ferguson, Missouri, which was planned as part of the organization's CrownCARES initiative. The Cavaliers' “Gear Up Sale” will save you 20 percent on your entire order from the corps' online store. Colts announced that Jack Riehl and Elijah Elmshaeuser will serve as the drum majors that will lead the corps through its 2018 season. Registration is now open for those interested in joining the 2018 Columbians. Heat Wave has partnered with RPT Percussion, a perennial WGI Class A finalist, to provide a year-round educational program for the youth of Florida. Sign up to be the first to know about upcoming Incognito rehearsal camps and auditions. Here's how to register for auditions for the 2018 edition of Legends. Join the Madison Scouts for the organization's Mad Dash 5K Run/Walk for Music Education on September 16 in Atlanta. If you are running in the annual Race for the Arts in Sacramento on Saturday, August 26, your entire fee will be donated to the Mandarins upon your specification. 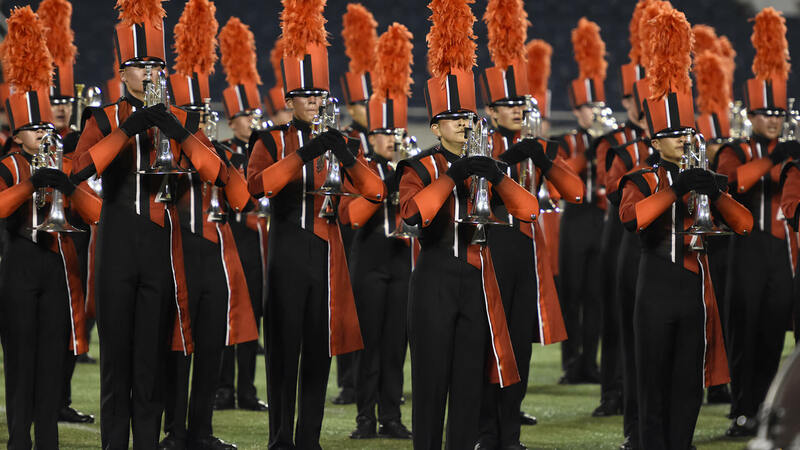 Music City is inviting prospective members to complete an interest form for auditioning for the corps' 10th anniversary season. Oregon Crusaders is selling its System Blue brass instruments purchased just this year. You can support Pacific Crest's scholarship fund by playing in the corps' annual charity golf tournament on October 13. Pioneer now has a form to request information on joining the corps for its 2018 season. River City Rhythm has posted a sign-up form for additional info on how to audition for the corps. Experience what it was like to be with Santa Clara Vanguard during the end of the corps' 2017 season in this recently posted video. Here is how you can join the 2018 edition of the Seattle Cascades. Spartan's annual Hall of Fame and Awards Dinner is scheduled for Saturday, August 26, in Hollis, New Hampshire. Check out this photo of Troopers director Fred Morris in awe of this week's solar eclipse.